Gach bliain, osclaítear doirse an chultúir don phobal uile. I mbliana, Dé hAoine, 21 Meán Fómhair a scaipfear cultúr, sa bhrí is leithne den fhocal. Seo cuid de na himeachtaí Gaeilge a tharraing ár gcuid airde! Rás curach ó Ché Theach an Custaim suas chomh fada le Droichead na Life agus ar ais (2km). Ní go minic a mbíonn deis ag muintir na cathrach blas a fháil ar chultúr bádóireacht na Gaeltachta, ach seo do sheans! Beidh píobaire ar cheann de na báid freisin! Currach racing on the Liffey, from Custom House Quay to the Ha’penny Bridge and back (2km). A rare opportunity to get a flavour of the boating traditions of the Gaeltacht, right in the middle of the city! A piper will lead out the boats! 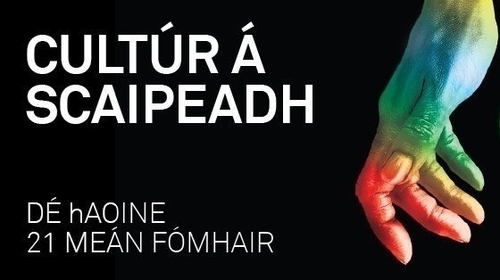 A building with a truly fascinating history, these days 6 Sráid Fhearchair houses a number of organisations who do hugely important work to promote and develop the Irish language. Sé cuimhneachán 125 bliana gluaiseacht athbheochán na gaeilge i mbliana agus tá clár náisiúnta d’imeachtaí ar siúl, Bliain na gaeilge, chun an teanga a chéiliúradh. mar sin, is áit iontach é 6 Sráid Fhearchair chun cuairt a thabhairt le haghaidh Oíche Chultúir. Beidh Taispeántas Amhránaíochta sa Chlub le amhránaithe na Cathrach ag bailiú le chéile chun seisiún oscailte shean–nóis a reáchtáil faoi stiúr Irial Ó Ceallaigh, amhránaí ar an sean Nós. An evening of sean-nós singing under the direction of well known singer Irial Ó Ceallaigh! Beidh ceol binn na bpíob le cluinstean arís i dteach beag ceann tuí ag bun Chnoc na Naomh. Suas le céad bliain ó shin bhí na tithe traidisiúnta seo beo le comhluadar agus ceol ag airneáil ar rith na hoíche. Le druidim an dorchadais agus an nós anois as an ngnáth, beidh an píobaire ag pilleadh arís go Teach Mhicí Mhic Gabhainn leis an seanspiorad a mhúscailt anseo i gCloich Cheann Fhaola, i nGaeltacht Dhún na nGall. Seisiún ceoil agus amhránaíochta le sólaistí ar fáil, oscailte don phobal. The piper returns to Teach Mhicí Mhic Gabhainn to revive the tradition of the oíche airneáil in this small thatched house. Bí mar dhuine de na 18 ar an mbus ealaíne ag taisteal thart ar an gceantar, nó lean iad as do stuaim fhéin. Faigh blaiseadh de cheol agus de chultúr Chloich Cheann Fhaola agus na Gaeltachta. Beidh ceol beo agus amhránaíocht ar an mbus. 6.00i.n. An tSeanbheairic: Tosóidh an chamchuairt ag an tSeanbheairic. Rachaidh an bus ar chamchuairt chuig Teampall Ráithe agus Cros Cholmcille, Cloich Cheann Fhaola, agus láithreacha cultúrtha agus oidhreachta eile sa cheantar. Déanfaí an Dr. Seosamh Ó Ceallaigh caint ghairid ar gach láthair. 7.15i.n. Teach Mhicí Mhic Ghabhainn: Mír drámaíochta ar shaol Mhicí Mhic Ghabhainn leis an aisteoir Conchubhar Ó Gallchóir. Amhránaíocht agus ceol le hamhránaithe óga ón gceantar. 8.30i.n. Teach na nAmhrán/The Song House: Cur i láthair gairid le hamhránaí traidisiúnta ón gceantar. 9.45i.n. An tSeanbheairic: Oíche cheoil agus tapas. Ceol flamenco, laidineach le Victor Donarumma, amhránaithe agus ceoltóirí traidisiúnta ón gceantar. Be one of just 18 on the art bus touring Cloch Cheann Fhaola this Culture Night, visiting heritage and cultural hotspots and returning for music and tapas at An tSeanbheairic.